I'd like to introduce myself...I am Jackie Larocque and this page is all about me! Well, it's a little about me. I have been fortunate to do what I wanted to do since I was a little girl. Work with animals. My path has taken me down the road of veterinarian assistant for domestic and exotic pets, wildlife rehabilitation, animal rescue with different SPCA’s, dog training, grooming and now writing. There has always been one constant in this path we call life, I’ve always had at least one dog walking with me, following me or causing me to chase them. My life as a dog trainer started in the early nineteen eighties when I was asked to stay on as an apprentice after taking Quila, my shepherd cross through obedience classes. From there I started competing in obedience, conformation, agility and fly ball with Toshi, Kitt, Jake and Boo. After attaining an instructor’s certification for dog obedience, I held a variety of pet obedience classes in different places I lived. My specialization became training dogs deemed un-trainable. Working in veterinary clinics kept me busy for ten years and eventually led me into pet grooming in the nineteen nineties. Combining my knowledge and skill as a dog trainer with my experience from veterinary clinics, I began to specialize in the dogs that were refused by other groomers. I love grooming dogs and cats, and still specialize in behavior dogs both in training and in grooming. Specializing in grooming challenged dogs, led me to develop and publish my first book Wet & Wild Puppy Grooming, A training manual for groomers, owners, breeders and anyone who works with dogs. Often times, when trying to figure out different methods of working with animals, I have been lucky enough to embrace the term “thinking outside of the box.” By this I mean that often traditional methods may not work. I attained a certificate in dog grooming in 2006 and am currently completing my masters in dog grooming. The year 2012 saw me heading to California to attain my masters in cat grooming as well as an instructor designation for cat grooming as well. By bringing all I’ve learned and continue to learn, to the animals I work with, I find that I am able to communicate better with the animals as well as the owners. I like to think of working with animals as a dance. Each animal that I work with has a different style, different movements and sways to a different rhythm. I need to learn their dance, as well as them learning mine and together we make up our own dance that is ours alone. My husband and three children are my heroes for bandaging my fingers when my reflexes aren’t quite fast enough, holding up tails for me to shave under them and bribing with a variety of food and toys. 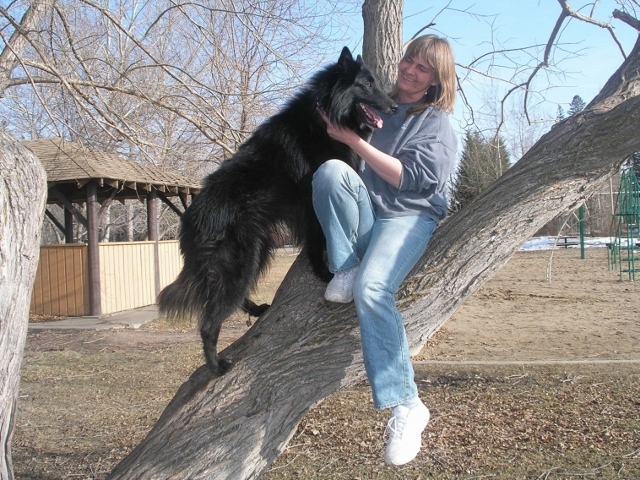 My current Belgian Sheepdog, Skye, is my four legged wonder, who always makes me shake my head and laugh at his antics. Echo is my rescue wonder dog who takes every thing to the limit. Willow and Storm who swack me whenever I’m slow on giving them tuna, keep me grounded with their cat demands. White Cat who is what she is. Pretzel and Zig Zag who slithered into my heart several years ago, always amaze me with the way they can move without legs. I presently own The Garage Grooming Shop where hairy days are common. We have fun, even during the crazy days and I have some of the best clients, both human and furry.